Agility is the fastest growing dog sport in the country! You are the coach, your dog is the athlete. The object of the game is to devise a strategy to send your dog over and through a prescribed course of obstacles. The aim is to find the proper balance between control of your dog and the speed of the performance. Every venue, whether sanctioned by AKC, UKI, or USDAA, has different class types, levels and even obstacles. 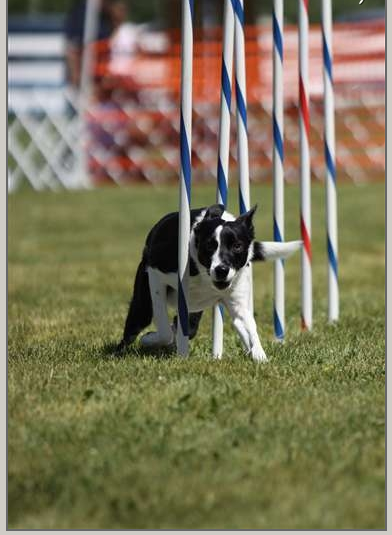 To be successful in agility, you must train your dog to leap over jumps, power through tunnels, navigate a slalom of weave poles and cross over ramps of different sizes and lengths. Scoring is similar to equestrian events in that you can be assessed "faults" for flaws in your performance. Complete the course without faults in less than a specified time and you have earn a "clean run." Your dog earns various titles by accumulating clean runs at various levels. 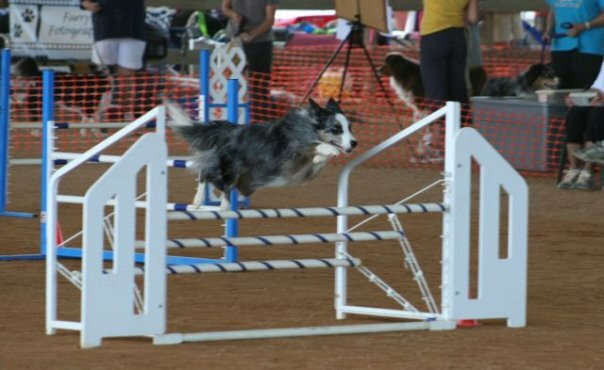 The GCOC holds several AKC-sponsored agility trials each year as do clubs in Charleston, Beaufort, Clemson, Charlotte and many other communities. If you become addicted and are willing to drive 3-4 hours to a trial, you can compete just about every weekend of the year! But wait ... before you start planning your calendar, you need to train your dog! Training your dog to do agility is just as much fun as competing in trials. It will take around two years for most people to train their dog to safely, accurately, and quickly perform all agility obstacles. GCOC holds classes in the fall and spring months to help you get going and "facility-using" GCOC members have access to our agility field year round. Many agility enthusiasts even practice agility in their backyards. Although a standard agility ring is 100 x 100 ft, you can do a lot in even small back yards with some homemade equipment. For more information regarding the Greater Columbia Obedience Club's Agility program, please contact us.